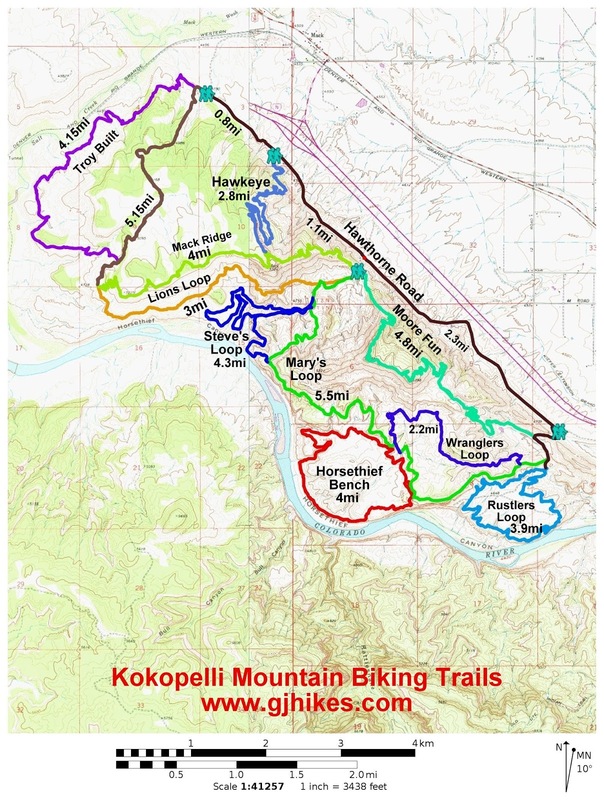 The Hawkeye trail is located in the Kokopelli Loops Area near Loma and Mack, Colorado. The trail begins at the Hawkeye trailhead off of the Hawkeye Road where it climbs a singletrack route that takes it up to a junction with the Mack Ridge trail. The trail was professionally designed to take advantage of various rock features that give mountain bikers a few more advanced options to take advantage of. Even though the trail was designed with mountain bikers in mind it also gets a lot of use from hikers. The hard packed adobe clay trail should be avoided when it is muddy. The trail climbs on a moderate slope as it heads up to the top of the ridge. The elevation profile for the trail shows the gradual ascent that it makes. There are more than a dozen switchbacks that aid in the climb. Many of the trails features are optional like this one although there are a couple of spots that don't have an alternative route. Even the more advanced riders should be able to find a few challenges along the way. Larger boulders start appearing the further up the mountain the trail gets adding some new scenery into the mix. Near the top of the ridge the trail takes a scenic route along the base of the cliffs. The Hawkeye trail comes to an end when it reaches the top of the mountain and meets up with the Mack Ridge trail. There is a map at the intersection to help you plan which way to go next. The Hawkeye trail was created as an alternate route to the steep section of road that has always been part of some of the loop rides like Lions and Troy Built. We hiked the trail when we took the photos for this post. The trail was getting a lot of use from a number of other hikers but most of the traffic was probably mountain bikers. 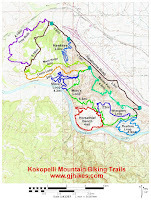 No matter how you get around on the Kokopelli Trails the Hawkeye trail is well worth checking out. If you would like to see it for yourself then all you have to do is 'Take a hike'.